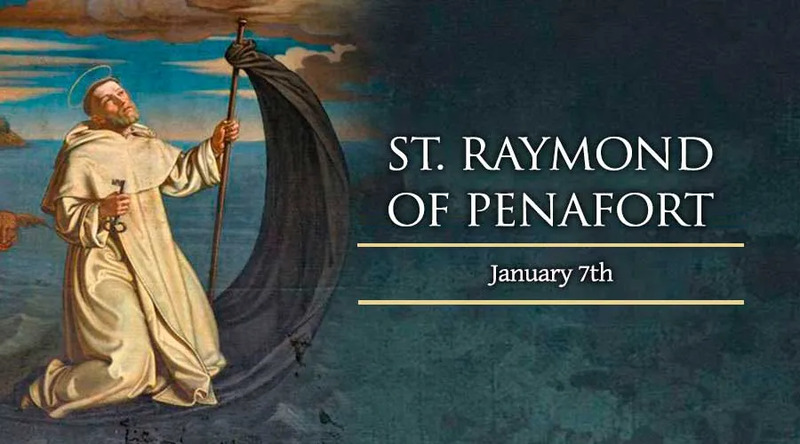 Saint Raymond of Penafort, a Dominican priest who worked to aid Christian captives during the era of the Crusades and also helped organize the Church’s legal code, will be celebrated liturgically on Jan. 7. A contemporary of Saint Thomas Aquinas, he inspired the theologian to write the “Summa Contra Gentiles” for the conversion of non-Catholics. At least 10,000 Muslims reportedly converted as a result of St. Raymond’s evangelistic labors. Descended from a noble family with ties to the royal house of Aragon, Raymond of Penafort was born during 1175 in the Catalonian region of modern-day Spain. He advanced quickly in his studies, showing such a gift for philosophy that he was appointed to teach the subject in Barcelona by age 20. As a teacher, the young man worked to harmonize reason with the profession and practice of Catholic faith and morals. This included a notable concern for the poor and suffering. Around age 30 the Spanish scholar went to study secular and Church law at Bologna in Italy. He earned his doctorate and taught there until 1219, when the Bishop of Barcelona gave him an official position in the diocese. During 1222, the 47-year-old Raymond joined the Dominican order, in which he would spend the next 53 years of his remarkably long life. As a penance for the intellectual pride he had once demonstrated, the former professor was asked to write a manual of moral theology for use by confessors. The resulting “Summa Casuum” was the first of his pioneering contributions to the Church. Meanwhile, in keeping with his order’s dedication to preaching, the Dominican priest strove to spread the faith and bring back lapsed and lost members of the Church. During his time in Barcelona, Raymond helped Saint Peter Nolasco and King James of Aragon to establish the Order of Our Lady of Mercy, whose members sought to ransom those taken captive in Muslim territory. During this same period Raymond promoted the Crusades through preaching, encouraging the faithful to defend their civilization from foreign threats. Pope Gregory IX called the Dominican priest to Rome in 1230, asking him to compile the Church’s various decisions and decrees into one systematic and uniform collection. The resulting five books served for centuries as a basis of the Church’s internal legal system. Raymond was the Pope’s personal confessor and close adviser during this time, and nearly became the Archbishop of Tarragona in 1235. But the Dominican did not want to lead the archdiocese, and is said to have turned down the appointment. Later in the decade, Raymond was chosen to lead the Dominicans, though he did so for only two years due to his advancing age. Ironically, however, he would live on for more than three decades after resigning from this post. During this time he was able to focus on the fundamentals of his vocation: praising God in prayer, making him known through preaching, and making his blessings manifest in the world. Raymond’s later achievements included the establishment of language schools to aid in the evangelization of non-Christians. St. Raymond of Penafort’s long pilgrimage of faith ended on Jan. 6, 1275, approximately 100 years after his birth. Pope Clement VIII canonized him in 1601. His patronage extends toward lawyers in general, and canon lawyers in particular.